As we approach election day, what will happen with the housing and finance industries based on the "winner" (the actual winning candidate, not the one with more quirky mannerisms)? Lets have some fun in advance and attempt to make some predictions. In a June 22, 2016 posting in Money.com, Taylor Tepper writes, “Stocks will plunge if Donald Trump is elected President. And the bond market could capsize if Trump goes ahead with plans to renegotiate the national debt. Yeah, but if Hillary Clinton wins the White House, she’ll cripple the economy by hiking taxes by $1 trillion. And oh, by the way, her foreign policy will end up destroying the world. As these are actual statements made by famous investors—like billionaire Mark Cuban and Swiss investment adviser Marc Faber—it’s understandable if you’re worried that the outcome of the election could upend your portfolio. Okay, so if there will be no noticeable financial effect, shall we chalk this up as a non-event and cover some other topic? Like perhaps we should stick with comics and jokes like last month? No, no, let’s “put it out there”. For example, what does John Q Public think will happen? Here’s what Trulia reported on 7/7/16. I must digress just a bit here. Note that the above chart was from a survey. That piqued my interest. Specifically, just how many Presidential election surveys ARE there? After much searching, I’m still not certain. There are polls run by states, there are national polls, there are polls run by news organizations, there are polls run by, well, polling companies. Check out the most recent poll results reported on RealClearPolitics.com. Or how about this Wikipedia chart showing even more polling sources and daily updated results? Mind boggling …. Although, at least in early August, they all seem to show a Clinton win, IF the polls results are directly correlated. Here’s more on surveys. 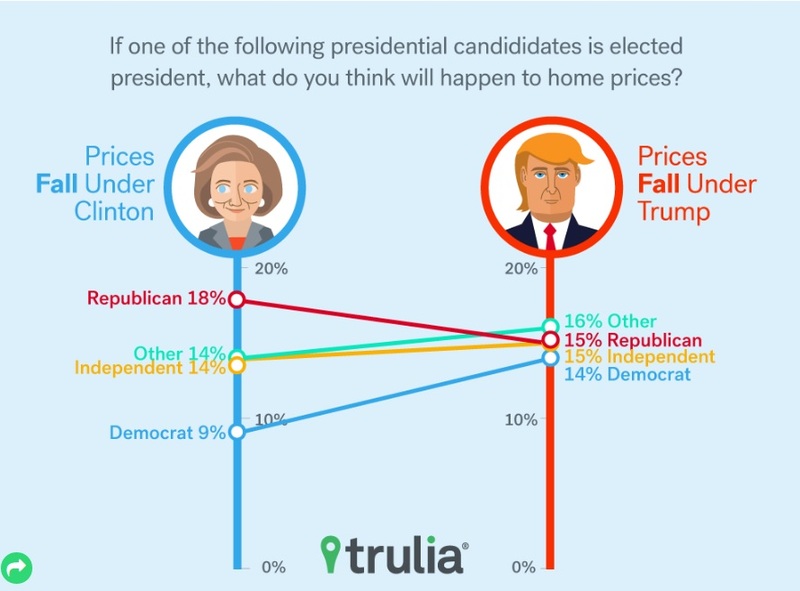 As reported in HousingWire.com, “In an effort to determine the potential impact of each of the presidential challengers, Zillow surveyed more than 100 housing experts about their expectations for the housing market, and specifically about how each presidential candidate would impact the housing economy. 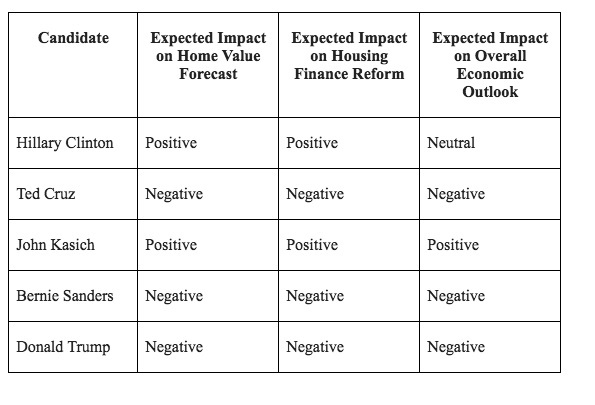 The experts were asked for their view on the impact each candidate would have on home values, housing finance reform, and the overall economy. Both Sanders and Trump do not fare well in the experts’ eyes. According to Zillow’s survey, the housing experts said that Trump and Sanders would both have a negative impact on home values, housing finance reform and the overall economy if elected. Of course, see this slightly dated chart from the same source. Apparently, when Kasich took a powder, a lot of the “positive” predictions went with him. But Hilary is second place in terms of “up-beat-ness”, so there is that. End of digression. We’re back focusing on how either Presidential candidate will affect housing etc. In “The Effects of a Trump or Clinton Presidency On the Housing Market”, a Professional Builder post, we start with the “non-event” quotes, similar to above. But, in addition to taxes and rising home prices, there are other housing issues. For example, what do the experts think will happen with First Time Homebuyers stats? On August 6, Rob Chrisman reported, “The link between politics and housing continues. Housing has not been a huge issue with the candidates although first-time home buyers are bearing the brunt of the appreciating market in many urban areas. But Hillary Clinton's choice for presidential running mate, Virginia Sen. Tim Kaine, has had some experience with the housing industry. He "cut his teeth" as a young lawyer fighting for fair housing issues, winning a $100 million jury verdict against Nationwide Insurance over allegedly discriminatory lending practices - "redlining." "I brought dozens of lawsuits when I was in private practice, battling banks, landlords, real estate firms, insurance companies and even local governments that had treated people unfairly," Kaine said. Kaine joined a small firm in Richmond, now called McCandlish Holton, where he focused largely on fair housing matters including the most high-profile case was brought on behalf of a local non-profit, Housing Opportunities Made Equal (HOME), which alleged that Nationwide Mutual Insurance Co. had discriminated against African-American neighborhoods through the practice known as redlining. On the other side, Trump has not made housing issues a centerpiece of his campaign, but from what is known, he plans to discontinue funding of at least some government housing programs and work to ease the current regulatory framework. Reporter Kendall Baer writes, "For example, he has specifically alluded to the possibility of eliminating HUD. Indiana, where Mike Pence serves as governor, was one of the states hit hardest during the financial crisis. By January 2015, vacant homes were an exponential problem for the state. In response, Pence passed a vacant housing statute preventing municipalities from passing ordinances on vacant homes and protecting banks holding liens from regulations requiring their maintenance. "'Really, the bottom line is we have made a dramatic effort to allow the local government to be the catalyst to clean up neighborhoods,' state Senator Jim Merritt, an Indianapolis Republican who sponsored the bill said at the time. 'It makes it a quicker process and a cleaner process.'" "Further, under Pence's watch the Indiana legislature initiated the Blight Elimination Program (BEP) to assist local government units in Indiana with foreclosure prevention. 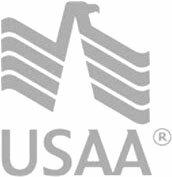 This program is sponsored by the Indiana Housing and Community Development Authority, a state government housing program." How can we expect the ultimate POTUS decision to directly affect the mortgage industry? USA Today attempts to provide a glimpse by reporting the candidates position on DODD-FRANK FINANCIAL REFORM. “Trump: Would dismantle most of the 2010 law passed in the wake of the financial crisis because it has restricted bank lending. It created the Consumer Financial Protection Bureau and requires large banks to keep bigger capital buffers, among other things. Impact: Modifying certain provisions could bolster economic growth, Daco says. But a repeal would wreak havoc for banks, which have spent millions to implement it. Clinton: Would defend and expand the law by imposing a “risk fee” on the largest banks and toughen a rule that bars them from making risky trades with their own accounts. The answer to the question of how the election will affect housing, then, depends on your position in life – literally and metaphorically. A banker will want to vote for a different candidate than a multi-billionaire or a first time home buyer versus a luxury home builder. Hmmm, this kind of seems like every election. “In a speech yesterday, Donald Trump spoke in favor of waterboarding. Trump said, ‘It’s how I got two of my three wives to say yes.’” — Conan O’Brien. “A new Quinnipiac University poll has Trump and (Hillary) Clinton almost tied. This is the first tie for Donald Trump that wasn’t manufactured in China.” — Jimmy Kimmel. “Although Hillary Clinton was cleared of charges in the investigation of her deleted emails, her actions were described by the FBI as ‘extremely reckless.’ However, in her defense, the report pointed out that she was Hillary reckless, not Bill reckless.’” — Conan O’Brien. “Top Secrets? I don’t think she should be allowed to handle Pop Secret. I wouldn’t trust you with Secret deodorant.” — Stephen Colbert.